Today was a day full of much celebration and a bit of sadness. We celebrated visitors and improvements at our church, and we both celebrated and grieved over our last Sunday with two of our short-term missionaries. In the afternoon and evening we celebrated Ezra's birthday with friends and two families in the process of adoption. This morning our church worshiped together for the first time under our new roof! Praise The Lord! The building used to have papyrus mats and a tarp as a covering, but the tarp had torn in many places and been broken down by the sun and wind. 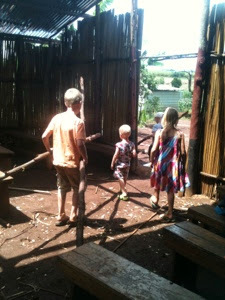 The rainy season was approaching and we did not have a way to stay dry during worship. So the church leadership asked the congregation to contribute toward the cost of iron sheets for a roof. Through the financial support we received from many of you, we were able to contribute toward the cost of iron sheets and provide a bit of labor by our family cleaning up the pieces of the old roof that were lying around after demolition. Here are some photos from the afternoon that we walked over to help. It was wonderful to be able to be a part of this project in a small way. As the church gathered this Sunday under our new roof, several of the Jajas (grandmothers) stood to praise God for His provision. One woman, through a translator, praised God for the new roof, and praised God for giving her the strength to work in her garden until 3pm without even getting hungry. She had been sick and lacking food. But the rains are here and God gave her the strength to work to grow food. Her joy in The Lord is always apparent as she worships and greets the other members of her church family. I realized that I have much to learn from these women. During the worship service we also had a time to pray for our two dear friends who have been serving alongside us for many months, but are now going back to the US. 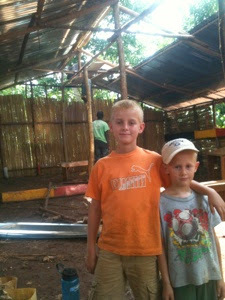 Stephen has been serving at GSF since before we arrived, working with the secondary students and university students. He has been a great friend to our whole family, a good friend to David particularly while I was away, willing to play sports and card games and wrestle with the kids, and a fabulous dinner guest who always does the dishes while we are getting the kids ready for bed. Gracie has been here for 4 months, and has become a dear friend in that short time. She and I often go for a run together, she regularly encourages me with Scripture and she is also great with our kids. These two dear friends will be greatly missed, but we are excited to see God's work continue in and through their lives as they go back to America and continue their education. Please pray for them as they readjust to American life after a long time away, and for us as we say goodbye. I told Stephen that I sometimes grow weary of saying goodbye to friends. He reminded me that goodbyes are a part of this finite life, but I am thankful that in eternity we will not need to say goodbye anymore. 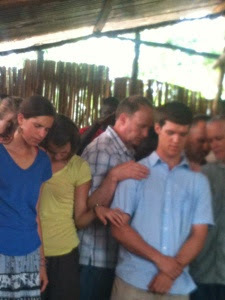 Here is a photo from the time at our church praying for these dear friends. Some members of Gracie's church are here on a short trip and they joined in this time of prayer; that is why there are so many mzungus in the photo. After worship and a relatively quick lunch, we headed out to Kingfisher, the pool where we like to go to celebrate birthdays. It was a fun time celebrating Ezra's 6th birthday, just a few days early. 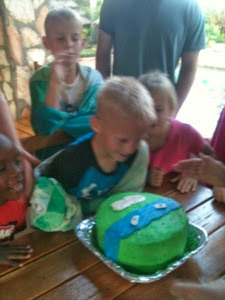 My friend Jennifer made him an awesome Ninja Turtle birthday cake!! We all had a great time at the pool, and it was fun to have some new friends also come along with their children since they are here in Uganda for several weeks waiting on the rest of their adoption paperwork to go through.